I do not like crossing talk of track driving with that of road driving, because the techniques and the method of how you drive the car for each environment are totally different and should never be confused with one another. That's why this article is separated in two parts. Part one is about normal street braking technique. Just for reference, check Heel and Toe article, can be useful. Braking and accelerating when racing on a road race course, even when dry, is treated something like driving on a wet surface, gently and smoothly. Braking and accelerating are used in conjunction with the corners, you brake before going into them and accelerate coming out of them. Because the objective is to have the car moving as fast as possible through the corner, the tires will be utilizing most of the available traction, they should be using 100% of the available traction, or as close as possible to that. You have to keep in mind that total available traction is finite value for certain part of the track and is changing all the time for different track parts. Traction available for tires is finite value too, and is always the same. Very rarely you can use all that tire traction, because you have to have some spare total available traction what you can use for example for gear change, additional braking, steering angle adjustment and all other stuff that involve weight transfer. You can learn more about that in my article "Traction circle". The driver must be very smooth with the use of the brakes going into the corner and with the accelerator coming out of the corner. A sharp change in braking or power at these points will upset the car's traction balance just as quickly as if you were driving on ice. Working within the last 1% of traction means there is no reserve to call upon to gain control of the car if something goes wrong. Even the pros very rarely recover a car that has lost control. It's not because they don't know how, it's because there's no available traction left to work with. It is imperative to learn how to be consistently smooth in braking and accelerating on a road course. There are three phases in competitive braking. First, braking begins with a rapid, but not instant, application of as much braking force as possible. How rapid the brakes can be applied will depend on the suspension in the car and the track surface. The stiffer the springs and shocks, the more rapidly maximum braking can be applied. Soft springs will have significant forward roll which will require a little longer and smoother ramp-up of braking to keep the car stable. Second, once the car settles onto the front tires, you'll be trying to minimize the length of the braking zone, so it will require taking the tires to the edge of locking up. You'll need to be very aware of the feedback vibrations in your foot given to you from the pedal and in your hands from the steering wheel to feel that small difference. The racing shoes are highly recommended. You just won't feel much from the pedals in Nike Air. The car will travel some distance using a fairly constant brake pedal pressure. The third phase is towards the end of the braking zone when the vehicle has been slowed to near its final speed. During this phase you can change to the lover gear to adjust for power output necessary to exit the turn. Gradually release pressure off the pedal making the transition from full to zero braking force as smooth as possible. During braking, the front tires are under heavy load which increases the available traction. But be careful, this will drastically reduce the available traction on the rear tires. A sudden release of the brakes will abruptly reduce the load and reduce the traction potential of the front tires which at this point is needed for turning into the corner. The turn-in is one of the points where the car will be the most sensitive to sudden weight transfer transitions as though it were being driven on ice. Indecisive braking resulting in a last second extra tap, or a sudden release of the brake pedal, and that will unsettle the car's handling and force the driver to slow down to gain control and hopefully avoid a spin or worst. As the braking zone completes, and you ease off the brake pedal, you will have to apply some throttle to reach a steady state of neither acceleration nor deceleration. Depending on the shape of the turn, the steady throttle zone will vary, but with a typical late-apex corner, it will be from the turn-in to just before the apex. In this phase you can use heel and toe technique to improve stability. That's the very simple way to explain braking before entering the turn if everything is going according to plan. Of course, on the racing track you are rarely in the ideal situation, and if situation is far from ideal, you have to modify you braking technique instantly. There could be a lot of strange situations in front of you. Another car in front of you destroying your aero downforce in this critical situation, accident, wind changing direction, oil or dirt on tarmac, tire condition, balance of your car. All of this situation will make influence on your braking stile. Most of the racing cars don't use ABS brakes, and in some situations is very easy to lose the grip and lock the wheel and spin. ABS senses when a wheel is about to lock up under braking, and when it does sense that moment, it releases braking effect at the particular wheel that is having difficulty. Once that has happened it then re-applies the brake many times per second. A revolving tire in contact with the road surface will give maximum braking efficiency at the point where it is on that knife-edge stage where it is about to lock up, but is still revolving. A skilled driver will be able to sense when and where this point will occur and be able to hold his or her foot in such a position on the pedal so as to maintain that point without locking the wheels. This will allow the car to stop in a shorter distance than if the vehicle was fitted with ABS, and where that ABS is being activated. There is a few braking techniques racing drivers use in this critical situations. All this techniques can be applied with road cars, but ABS system is enough to control this situations. Threshold braking or limit braking is a braking technique used in motor and auto racing, but can be also used in road cars to slow at the optimum rate using the brakes. This is used in vehicles without an ABS. The technique involves the driver controlling the brake pedal pressure to maximize the braking force developed by the tires. The optimal amount of braking force is developed at the point when the tire just begins to slip. Braking beyond this point causes the tire to lock and slide and the grip between the tire and driving surface is reduced. The reason to use threshold braking is to keep the amount of tire slip at the optimal value, value that produces the maximum grip, and thus braking force. When wheels are slipping significantly (kinetic friction), the amount of friction available for braking is typically substantially less than when the wheels are not slipping (static friction), and in this way reducing the braking force. Peak friction occurs between the static and dynamic friction endpoints, and this is the point that threshold braking tries to maintain. Because available friction at a given moment depends on many factors including road surface material, temperature, tire rubber compound and wear, threshold braking is nearly impossible to consistently achieve during normal driving. 1- Press the brake pedal as if you were braking normally. 2- Smoothly increase brake pedal pressure until wheels lock up. On all but the highest grip surfaces the front wheels will lock first by design. 3- Reduce brake pedal pressure by a small amount, enough for the locked up wheels to regain traction and start rotating again. 4- If more braking is desired in this point, driver can switch to cadence braking. In a situation where a car needs to turn or swerve to avoid a collision but is traveling too fast the above technique allows the driver to retain steering control of the car while rapidly decelerating. 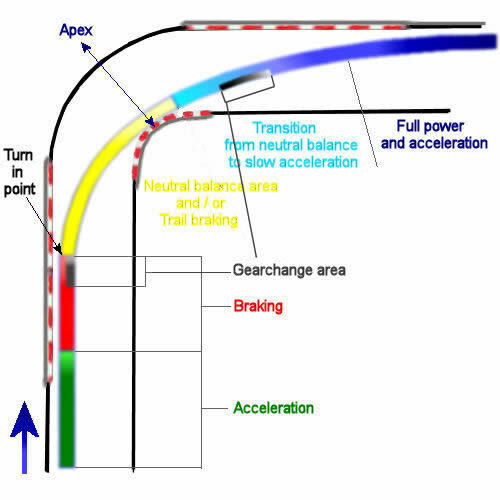 Cadence braking is an advanced driving technique used to allow a car to both steer and brake on same time. If you lock the front wheels under heavy braking, you can no longer steer. ABS (anti-lock braking) automatically keeps the tires on the point of locking so that you can continue to steer as well as slow down. If you don't have ABS or you are driving the racing car, you will use cadence braking. You lock the wheels, and then release the brakes so that you can steer, brake again, release and steer again in sequence until you have avoided the hazard. This is particularly useful on slippery roads, but it takes a lot of practice and quick thinking to be able to release the brakes when you are sliding towards the hazard. It needs to be learned and practiced!! Cadence braking involves pumping the brake pedal fairly rapidly but deliberately, to make the wheels lock and unlock. This is done primarily to maintain steering control, at least in part. While cadence braking is effective on most surfaces, it is less effective at slowing the vehicle, than keeping the tires continually at the optimum braking point which is called threshold braking. Cadence braking (or any other type of braking) will not help much on extremely slippery surfaces such as ice. Also, on very loose surfaces, a quicker stop can be achieved by simply locking the wheels, causing a wedge of loose material to build up ahead of the wheels and create a substantial braking force. In such conditions, cadence braking, same as ABS, actually increases the stopping distances. On poor surfaces, in the past, rally drivers timed the pulsing of brake to take advantage of the load transfer as the vehicle pitches forwards and backwards in response to the initial braking effort. With modern over damped, stiffly sprung, suspensions this is less effective. Threshold braking, or a good ABS, generally, but not always, results in the shortest stopping distance in a straight line. Trail braking is a mostly motorcycle riding and driving technique where the brakes are used beyond the entrance to a turn and are gradually released up to the point of apex. But often is used in car racing too (Heel and toe again!). Trailing off the braking pressure either while straight line braking or, after turn in has begun, allows for a less abrupt and more accurate final corner entry speed adjustment. Some corner entries, such as decreasing radius turns, are more adapted to the leaned over trail braking technique. In turns where a quicker steering action is more applicable, trailing the brake while turning in is unnecessary. In applying this technique, motorcycle riders approach turns applying both front and rear brakes to reduce speed. As they enter the turn, they slowly ease off the brakes, gradually decreasing or "trailing" off the brakes as motorcycle lean increases. In this moment, very often you can see rear tire start to slide out of corner but without any tire lock. This technique is used for several reasons. First, this gives more traction because the front tire is forced into the pavement under the weight transfer of the vehicle. Second, as the brakes are applied and the weight shifts forward the forks are compressed. The compression of the forks changes the motorcycles steering geometry, decreasing stability in a way that makes the motorcycle want to lean and change direction. 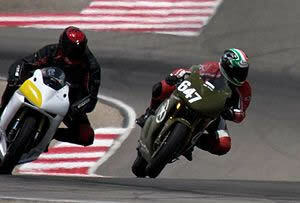 Thus, trail braking can be used as method to help the motorcycle change direction. Additionally, decreasing speed decreases the motorcycles cornering radius, while, conversely, accelerating while turning increases the motorcycles cornering radius. Traditionally, trail braking is done exclusively with the front brake even though trailing the rear brake will effectively slow the motorcycle, also decreasing the turning radius. It should be noted that the rider's ability to correctly choose his turn in, apex and exit points reduces or eliminates the necessity of prolonged trailing of the brakes into turns. Also to be noted, the longer the rider trails the brake into any given corner the later will be his application of the throttle. The throttle is responsible for the machine's ultimate stability and traction. It is desirable to begin throttle application as soon as possible once an acceptable racing line is established. Finally, trailing off the brakes while entering blind or tight corners allows the rider to slow if something unexpected blocks the rider's path. Because the motorcycle is already on the brakes and the front tire is getting additional traction from higher load and grip, the rider can slow even more with very little risk, depending on surface conditions. However, applying the brakes after the motorcycle is already leaned over can be exceedingly risky depending on surface conditions and lean angle. There is already roughly 70% of the bike's weight forward from being off the gas so applying braking pressure significantly increases that load on the smaller front tire. This technique is commonly used when racing, but can enhance control and add more evasive options for street riders, making it very worthwhile to learn or at least understand. Worth noting also is that most current (2000 through 2008) racing crashes happen while trailing the brakes into turns, amongst world class Moto GP riders. In 4-wheel vehicles trail braking pertains to using the brakes past the corner entrance (as opposed to the normally taught practice of releasing the brakes before starting the turn). This practice is used for creating weight transfer towards the front tires, thus increasing their traction and reducing understeer. During trail braking, front tires, together with outside tires are loaded – this type of motion is sometimes referred to as warp. It works best in light vehicles that have their brake bias to the front. But often is used with heel and toe technique. In order to be properly performed, the driver must have excellent sense of the car behavior and be able to keep the braking effort within very tight limits. Excessive braking effort may result in the vehicle heavily understeering, or - if the brake bias is set to nearly neutral - in the rear wheels locking, effectively causing the vehicle to spin as in a handbrake turn. Once a driver has mastered trail braking, it can help enter the corners at higher speeds, or avoid an accident if the driver has entered a corner at a speed exceeding the car or driver capabilities. Opponents of trail braking claim that because of the steep learning curve trail braking is, or should be an exclusively race track or racing technique. However, proponents of trail braking believe that knowing and understanding how to slow while entering a corner gives the driver a greater safety margin, particularly in blind, decreasing radius or downhill corners. Reverse Trail Braking is a variation of trail braking that can actually assist a motorcycle rider in turning his machine quicker in closely linked -S- curves or chicanes. In this use the rider applies some front brake as the steering change is being done. Because a motorcycle tends to "stand up" from the front brake application it more rapidly and efficiently brings the machine over to the opposite side, when used in conjunction with standard counter-steering inputs. This is an advanced riding technique which is only applicable to track riding and racing. A drift-inducing technique called "the brake drift" is used in racing, involving a series of light trail-braking pulses (usually 2 or 3), followed by a momentary full-force braking and sharp releasing of the brakes. Mastering continuous trail braking as used under road conditions is a prerequisite for learning brake drifting. This is one of the most used drifting techniques in rally racing because - if done properly - allows the driver to enter and exit the corner with full throttle. At the beginning of 2014 and increased fuel saving strategies we can hear new word in use: "COASTING". This mean that drivers do not want to use brakes to prepare for corner entry, but instead they use drag of the car to slow the car to desired corner entry speed. In other words (corner drawing on the beginning of the article), driver will lift the foot from accelerator in some point before normal braking point and let the drag slow the car to desired speed. In this way he can use less fuel because he is not accelerating for so long. This technique cost lap time for the same reason - driver is not accelerating for so long time. So, he can save the fuel with lap time cost. This technique is usable if you have some advantage compared with next driver behind you.